Eithinen Ffrengig. Onn. Ulex gallii. Smouldering on mountain and heath, thousands of yellow flowers gilding the hillsides year round, it is not surprising that gorse is symbolically linked with fire and the sun. Ubiquitous with ‘wild’ landscapes: rugged hills, coastal regions, open heath and lonely moors, western gorse (Ulex galli) is a spiny evergreen shrub in the pea family with many useful properties and steeped in ancient lore. Other names include furze, from the Anglo Saxon fyrs, and whin. Gorse is also an Anglo Saxon derived word, gorsts, meaning to waste, indicative of the exposed, harsh environments gorse thrives in. In Gaelic, gorse is Conasg, meaning armed, referring to its prickle studded branches. It is associated with ‘O’ on the Gaelic tree alphabet, for ‘onn’ or ‘oir’, meaning gold. Associated with Celtic sun god Lugh, gorse holds a spark of the sun all year round. In Celtic tradition, the plant was believed to have many magical properties. In Wales, it was a traditional deterrent against witches, and swathes of gorse were often burnt to try and smoke out those practising magic within its thickets. This practise was good news for the gorse though, as the seed requires heat to burst and spread, and is adapted to germinate after it has been scorched. You can hear the seeds popping on a hot summer day, sometimes travelling as far as ten metres. Gorse is commonly used as a boundary, both in this realm and the next! It is an efficient, natural way of penning in livestock and protecting young saplings, and it was believed to mark the boundaries of the Otherworld, a spiny protector of the faeries. Farmers believed these protective qualities extended to their livestock, keeping them safe throughout the year, and they would also grind up gorse as fodder. They would tend to it by burning it back regularly, helping new growth. Kilns and fires were also fuelled by gorse, which burns so well due to the oil content of its leaves and branches. As one of the trees sacred to Celts and druids, gorse was often used to start ceremonial fires, particularly for the May fire festival of Beltane. Herds of livestock would be driven between fires to bring them protection, and torches of gorse were carried through farmland and buildings to cleanse the air and bring fertility to the animals. 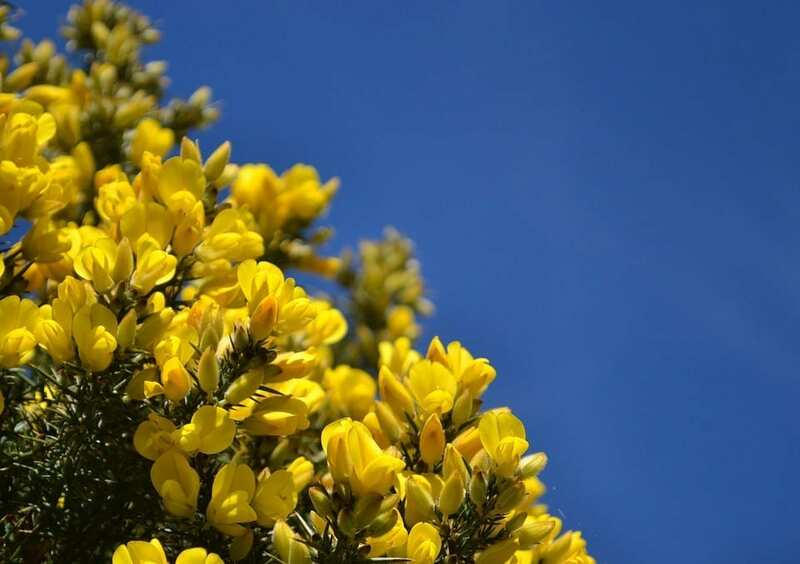 Gorse isn’t just a friend to domesticated animals, and many wild bird species use its impenetrable, dense forests to build their nests and as feeding sites. It is particularly associated with supporting linnets, yellowhammers and warblers, and a good sprawl of gorse is often alive with birdsong, tinkling from within its depths. In Wales, the rare coastal shelduck (Tadorna tadorna), nests in rabbit holes beneath gorse, and give the duck its Welsh name hwyaden yr eithin, the gorse duck. Welsh place names containing eithin indicate that, historically, gorse was an important part of that area. Its long flowering season provides valuable food for bees, either early in the spring when flowers are scarce, or later in the year when other flowers have given themselves over to autumn. Some moth species eat the flowers, and insects also feed on gorse. Traditionally part of our own larders, its heady coconut and vanilla aroma can be tasted in wines, cordials and pickles and in Ireland was used to colour and flavour whisky. Gorse can also be used to create a yellow dye. Gorse is good for soil as it is a nitrogen fixer, and can help make soil less acidic by ‘grabbing’ calcium from subsoil, and depositing it on the top soil when its branches drop, or it dies. It truly is a remarkable plant and, blazing year-round on the hillside, it is a beacon of hope, a reminder of sun, light and fruitfulness in the darkling winter months.